The Sin is before all else an offense against God, a rupture of communion with him. At the same time it damages communion with the Church. For this reason conversion entails both God's forgiveness and reconciliation with the Church, which are expressed and accomplished liturgically by the sacrament of Penance and Reconciliation. Only God forgives sins. Since he is the Son of God, Jesus says of himself, "The Son of man has authority on earth to forgive sins" and exercises this divine power: "Your sins are forgiven." Further, by virtue of his divine authority he gives this power to men, Apostles to exercise in his name. Christ has willed that in her prayer and life and action his whole Church should be the sign and instrument of the forgiveness and reconciliation that he acquired for us at the price of his blood. But he entrusted the exercise of the power of absolution to the apostolic ministry which he charged with the "ministry of reconciliation." The apostle is sent out "on behalf of Christ" with "God making his appeal" through him and pleading: "Be reconciled to God." During his public life Jesus not only forgave sins, but also made plain the effect of this forgiveness: he reintegrated forgiven sinners into the community of the People of God from which sin had alienated or even excluded them. A remarkable sign of this is the fact that Jesus receives sinners at his table, a gesture that expresses in an astonishing way both God's forgiveness and the return to the bosom of the People of God. In imparting to his apostles his own power to forgive sins the Lord also gives them the authority to reconcile sinners with the Church. This ecclesial dimension of their task is expressed most notably in Christ's solemn words to Simon Peter: "I will give you the keys of the kingdom of heaven, and whatever you bind on earth shall be bound in heaven, and whatever you loose on earth shall be loosed in heaven." "The office of binding and loosing which was given to Peter was also assigned to the college of the apostles united to its head. The words bind and loose means: whomever you exclude from your communion, will be excluded from communion with God; whomever you receive anew into your communion, God will welcome back into his. Reconciliation with the Church is inseparable from reconciliation with God. "Penance requires ... the sinner endure all things willingly, be contrite of heart, confession with the lips, and practice complete humility and fruitful satisfaction". Contrition is "sorrow of the soul and detestation for the sin committed, together with the resolution not to sin again." The confession (or disclosure) of sins, even from a simply human point of view, frees us and facilitates our reconciliation with others. Through such an admission man looks squarely at the sins he is guilty of, takes responsibility for them, and thereby opens himself again to God and to the communion of the Church in order to make a new future possible. Confession to a priest is an essential part of the sacrament of Penance: "All mortal sins of which penitents after a diligent self-examination are conscious must be recounted by them in confession, even if they are most secret and have been committed against the last two precepts of the Decalogue; for these sins sometimes wound the soul more grievously and are more dangerous than those which are committed openly." When Christ's faithful strive to confess all the sins that they can remember, they undoubtedly place all of them before the divine mercy for pardon. But those who fail to do so and knowingly withhold some, place nothing before the divine goodness for remission through the mediation of the priest, "for if the sick person is too ashamed to show his wound to the doctor, the medicine cannot heal what it does not know." According to the Church's command, "after having attained the age of discretion, each of the faithful is bound by an obligation faithfully to confess serious sins at least once a year." Anyone who is aware of having committed a mortal sin must not receive Holy Communion, even if he experiences deep contrition, without having first received sacramental absolution, unless he has a grave reason for receiving Communion and there is no possibility of going to confession. 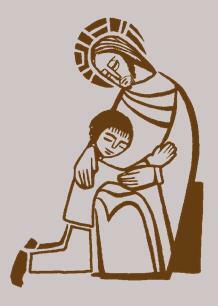 Children must go to the sacrament of Penance before receiving Holy Communion for the first time. Without being strictly necessary, confession of everyday faults (venial sins) is nevertheless strongly recommended by the Church. Indeed the regular confession of our venial sins helps us form our conscience, fight against evil tendencies, let ourselves be healed by Christ and progress in the life of the Spirit. By receiving more frequently through this sacrament the gift of the Father's mercy, we are spurred to be merciful as he is merciful. Whoever confesses his sins . . . is already working with God. God indicts your sins; if you also indict them, you are joined with God. Man and sinner are, so to speak, two realities: when you hear "man" - this is what God has made; when you hear "sinner" - this is what man himself has made. Destroy what you have made, so that God may save what he has made. . . . When you begin to abhor what you have made, it is then that your good works are beginning, since you are accusing yourself of your evil works. The beginning of good works is the confession of evil works. You do the truth and come to the light. The whole power of the sacrament of Penance consists in restoring us to God's grace and joining us with him in an intimate friendship." Reconciliation with God is thus the purpose and effect of this sacrament. For those who receive the sacrament of Penance with contrite heart and religious disposition, reconciliation "is usually followed by peace and serenity of conscience with strong spiritual consolation." Indeed the sacrament of Reconciliation with God brings about a true "spiritual resurrection," restoration of the dignity and blessings of the life of the children of God, of which the most precious is friendship with God. This sacrament reconciles us with the Church. Sin damages or even breaks fraternal communion. The sacrament of Penance repairs or restores it. In this sense it does not simply heal the one restored to ecclesial communion, but has also a revitalizing effect on the life of the Church which suffered from the sin of one of her members. Re-established or strengthened in the communion of saints, the sinner is made stronger by the exchange of spiritual goods among all the living members of the Body of Christ, whether still on pilgrimage or already in the heavenly homeland: It must be recalled that . . . this reconciliation with God leads, as it were, to other reconciliations, which repair the other breaches caused by sin. The forgiven penitent is reconciled with himself in his inmost being, where he regains his innermost truth. He is reconciled with his brethren whom he has in some way offended and wounded. He is reconciled with the Church. He is reconciled with all creation. In this sacrament, the sinner, placing himself before the merciful judgment of God, anticipates in a certain way the judgment to which he will be subjected at the end of his earthly life. For it is now, in this life, that we are offered the choice between life and death, and it is only by the road of conversion that we can enter the Kingdom, from which one is excluded by grave sin. In converting to Christ through penance and faith, the sinner passes from death to life and "does not come into judgment.". for more information about this Sacrament please visit The Holy See.